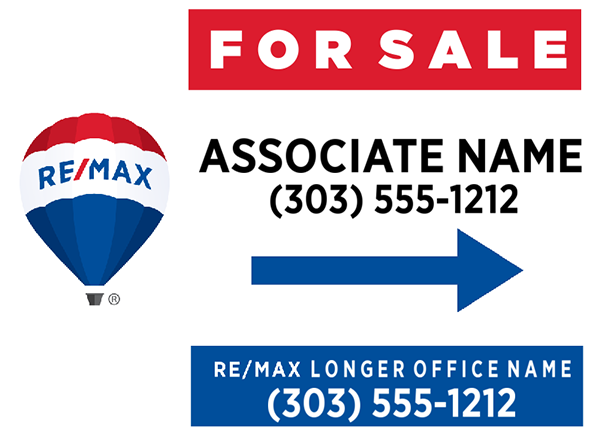 RE/MAX® SIGNS Brand Refresh Templates ARE HERE! Our rigid PVC standard RE/MAX® signs are ideal for years of use. 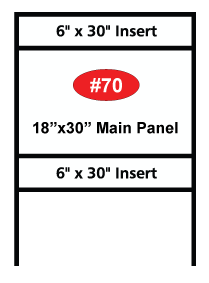 We also sell several configurations of metal frames to display your signs and riders. Our lightweight Coroplast® (corrugated plastic) signs are a surprisingly durable, cost-effective alternative to solid PVC. We also have sign stakes for the lightweights we sell. All frames are ordered separately. Custom Sign Center complies with all the new style guides, branding and trademark requirements in place for your RE/MAX® signs. You'll find each design template to have your current logo, colors, and typefaces appropriate for your brand. Get your custom signs today! 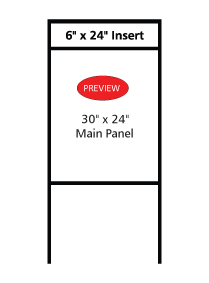 While we are not an approved vendor, yet, of RE/MAX® signs we do follow all style gudelines and rules in our panel designs and templates. Miracle Home Network Rider Coming soon! Just like our RE/MAX® Real Estate partners we go above and beyond to make it easy. RE/MAX® Agents sell hundreds of homes helping thousands of families and we want to make your job, and your day, as easy as possible. You work hard at your open house, dealing with buyers and sellers, there's no reason you should have to work hard to get what you need to work hard. Create your signs today and have them fast, our turnaround time is 24-48 hours on typical orders and we also offer expedited shipping options. Some of you may be looking for banners, we have that, too! create your own banner from scratch here. Your new logos, colors, and fonts are set up specifically for our RE/MAX® Agents. We'll review the design and replace any low resolution images with crisp clear high resolution images that we have on file to make your custom RE/MAX® banner or vehicle magnet exactly what you need. It's fast and easy, and won't break the bank! 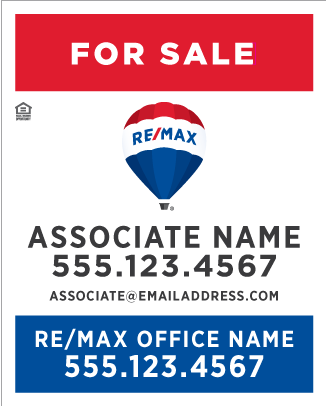 Purchasing your real estate signs through Custom Sign Center allows RE/MAX® agents to advertise their listings using their own unique signage in a number of mediums. We offer lightweights, made of coroplast® as well as the heavier PVC. We also offer house shaped signs and directional signs for your inventory of RE/MAX® signage for open houses, rental housing or basic outdoor advertising. 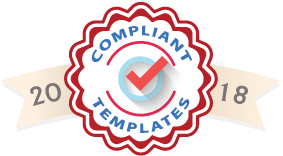 We have many RE/MAX® style guide compliant templates from which to choose. If you don’t see something that you are looking for, let us know and we’ll create a new template for you. 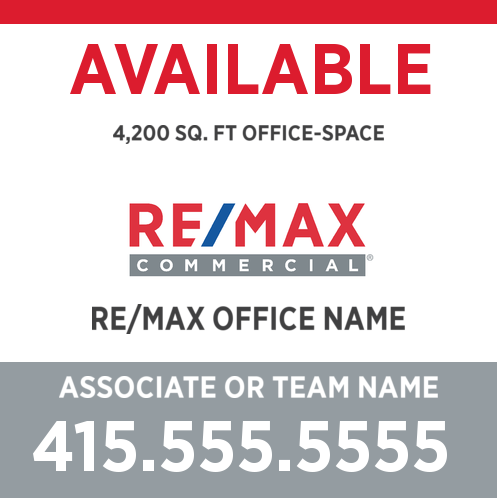 RE/MAX® style guide compliant signs are easily recognized by the general public. Branded by the Style Guide Book our templates work across RE/MAX® brokerages, states and even countries. We make it easy for you to save your designs for later purchasing. Just register on the site and save your personal clipart images, such as your Agent photos, and save your completed designs right there inside our designer. 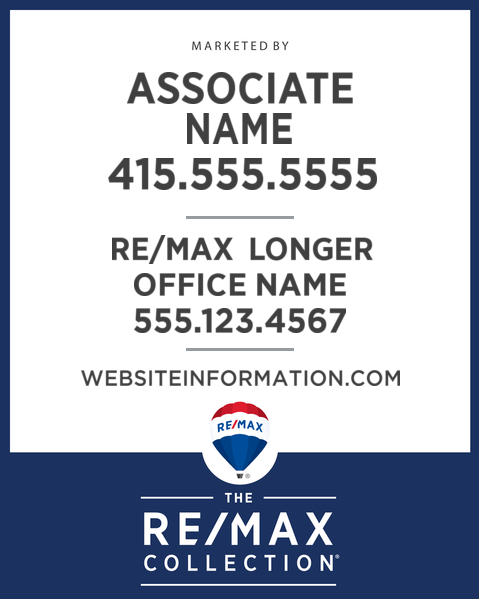 All of your RE/MAX® real estate signs should carry your name, phone and website. 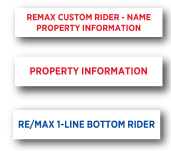 All of our RE/MAX® panel signs are quickly customizable to add that information and when you’re signed in just save it and you can log in the next time you need the sign to click, click, and order right quick! If you’re in need of a large number of signs for a mass advertising campaign we offer inexpensive coroplast® signs with great quantity discounts so you don’t have to worry about breaking the bank to get the signs you need. We don’t just offer panels, directional and lightweight signs we also have vinyl banners in an array of sizes that you can customize how you like for any event or gathering. 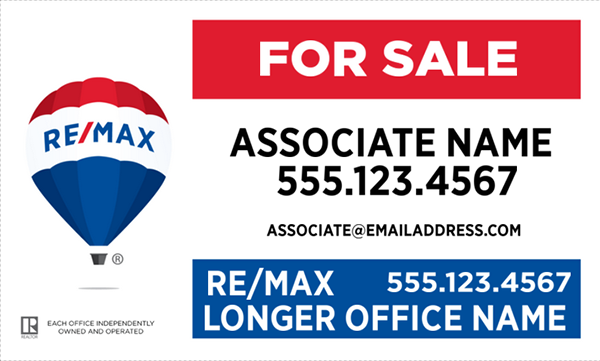 Magnets are also a great way to advertise your RE/MAX® brand on your car as you travel around. 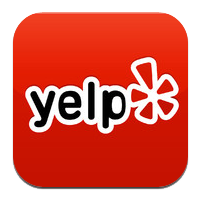 Hundreds of potential clients will see your information. Our vehicle magnets also come in an array of sizes and shapes to meet your needs and are easily designed. There is no need to go anywhere else for your custom RE/MAX® signs. Custom Sign Center can take care of all your signage and keep your inventory compliant so you never have to worry about having the wrong color, logo or configuration; it’s all right here for you.